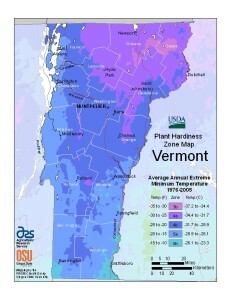 If you have not seen it yet take a look at the latest USDA Plant Hardiness Map. It is based on new data collected by almost 8000 federal weather reporting stations across 30 years from 1976 to 2005. By contrast the earlier USDA map was based on just 12 years of data from 1974 to 1986. For each reporting station the yearly minimum temperatures were summarized and then verified. Then, for each station, the arithmetic average across those 30 years was calculated to provide its average minimum temperature for that reporting period. As we all remember from our high school math, an average is just that…so we know that some years saw lower temperatures and other higher than the average. Winter temperatures at higher elevations are typically several degrees colder than in nearby low-lying areas. Winter temperatures near a large body of water will be a few degrees warmer than equivalent areas just twenty miles away. Enter your zip code. It comes back with the minimum temperature range for that ZIP code, plus the corresponding plant hardiness zone. Now look at the high resolution color map of your state. Since this shows individual towns you can more precisely pinpoint your exact location, which may alter your zone. Check out the page marked INTERACTIVE MAP. Drag the map until it is centered over your state. Then zoom all the way in until you can see county boundaries and nearby highways where you live. Now spot the cursor on your exact location, and the system will display the specific average minimum temperature (not just a range), the corresponding plant hardiness zone, as well as your latitude and longitude. When I enter my ZIP code it indicates I am in Zone 5A. However this does not quite square with my experience. in most winters over the past 17 years we have had temperatures at or below -20° . However we live in the mountains, over 1000 feet higher than the geographic center of our ZIP code. And I know from watching the car thermometer that our winter temperatures run about 8°F colder than in the valley. By looking at the colored state map, which shows individual county boundaries, I can pinpoint our location more precisely, and see we are actually in Zone 4B. The interactive map gives me a bit more precision. I set the cursor at our exact location and find our average minimum temperature is -21.7°F…which puts me in Zone 4B and also squares well with my experience. I also see my latitude is 43.86° (useful when thinking about day-length variations). What does the new USDA map tell the gardener? The new map is easy to use, and provides a number of ways to get at the data of interest. If you have lived where you do for a while it may feel redundant to experience and common sense. But it is still worth checking it your experience. If you are new to your area…or if you are helping someone who lives someplace else, it is clearly a wonderful resource. And before you dispense gardening advice to friends or family it is most instructive to check out the growing conditions for their area!! A few years back I was helping my son and daughter-in-law in southern California choose plants for their new garden…Zone 10A and an average minimum temperature of 32.2°F. I wish I had had this information back then. Of course for them I also had to delve into ‘heat zones’…which was its own learning experience for this New England gardener. 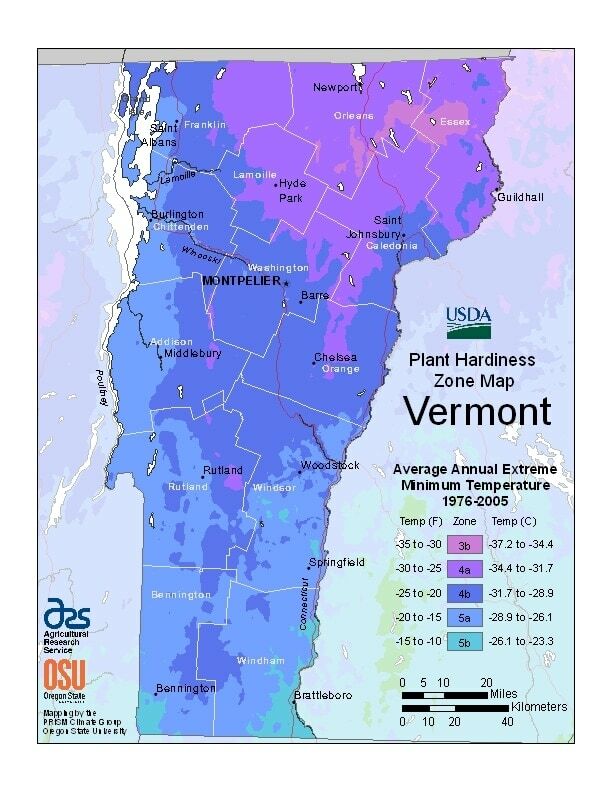 And finally: a comparison between the new zone map for Vermont with one many of us have used which is based on 60 years of data from the first half of last century is also very instructive. It clearly shows that many parts of the state are now indeed a half zone warmer, although other areas, particularly in the vicinity of Lake Champlain, remain unchanged. « How cold is cold?